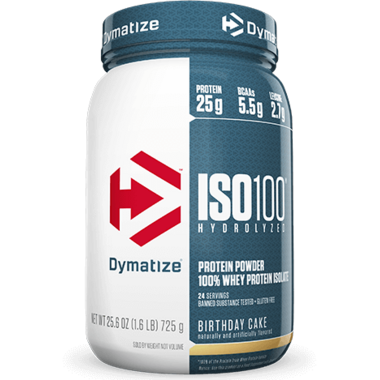 Dymatize Nutrition ISO100 Hydrolyzed Whey Protein Birthday Cake is simply muscle-building fuel. Each serving contains 25 grams of protein and 5.5 g of BCAAs including 2.7 g of L-Leucine. Known worldwide for quality, taste and purity, ISO100 is produced to their highest quality standards. ISO100 is formulated using a cross-flow micro filtration, multi-step purification process that preserves important muscle-building protein fractions while removing excess carbohydrates, fat, lactose and cholesterol. ISO100 is made with pre-hydrolyzed protein sources to ensure fast digestion and absorption. Dymatize knows that maximum protein utilization is essential to aiding muscle recovery and maintaining a positive nitrogen balance, which is critical during periods of intense training. There is no higher standard of protein than ISO100, so feel confident that you will be feeding your muscles to their fullest potential! I don't generally like anything sweet but have been struggling to find a flavour I like. This one is perfect, not too sweet and a pleasant flavour. Big thing for me is that it also breaks up well quickly so no lumps! The flavour met up to its name. I got it mainly to have an option to satisfy late day sweet cravings and wanted to stick to a brand that does not amino spike their products. Unfortunately for me my kids have discovered it and I'm no longer allowed to have any. This protein is delicious and has an excellent nutritional profile. It actually tastes like birthday cake, not just vanilla-y, which is something I've noticed with a lot of "cake" flavoured proteins. My only dislike about this protein is that it is very sweet, so I end up mixing it with more liquid than I normally would, but that's no big deal. I will definitely buy it again!